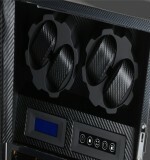 Tiara II Carbon Fibre 4 Watch Winder just for you.. I had read reviews on the this watch winder and decided to order it . First I noticed how quiet it runs and how much I like the attractive display case . Secondly it came with five selections for turns which is more than adequate for most watches . I am well pleased and would recommend this winder to any buyer . I like it, especially since it is able to run either on AC or battery operated. Beautifully finished and well thought out. Most importanbtly, the motors are absolutely silent. Great product, well priced and simple to use. beautiful, quiet, arrived quickly. My 2nd winder from them. Fastest delivery and best service! Nice and quiet. 2 thumbs up! 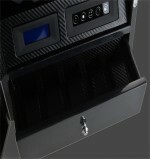 I researched many of the watch winders available for automatic watches and this model stood out. My prior experience with watch winders has not been good so that is the reason I researched new ones extensively. I really liked the features of this winder and decided to take a chance. I have not been disappointed with my choice. When the unit arrived, I was pleasantly surprised with the performance of the unit. First of all, it is extremely quiet. Received my Watch Winder yesterday and WOW, what a beautiful piece. Bought it on GSS sale, the finish is sibei tok kong, no sound completely even when door is open, seriously i am impress at this price!!!! I believe I read somewhere the long term maintenance of an automatic watch is best if kept on a winder, but that might be my imagination. This is a great looking addition to anyone's room or Wardrobe area. Excellent product that works as advertised. It's easy to use, quiet and unobtrusive. Great looks, quality finish, feature rich, silent and easy operation. The key thing for me is that this winder works great and totally silent. Double thumbs up! Nice winder for the money. My 2nd winder from same them. Perfectly fits even for big watches - like Panerai. looks nice and ita definitely built to last. Just received this two days ago. The packaging was great and you could tell great care was taken in shipping the product. Setup was easy and making the settings for each individual watch was easy. This winder looks amazing. It was packaged with the care of a high end watch. It looks beautiful and it works flawlessly plugged in or running on batteries and keeps our watches running without losing or gaining time when not being worn. Delivered on time and works beyond my expectation. The product description is great, but reality is better! Started quickly easy to set up - took 5 minutes. Very nice watch winder. Works exactly as advertised and is exceptionally quiet. I am very pleased with this purchase and would buy it again without hesitation. VERY NICE! Can't hear the motor and the construction and finish is excellent! This is a very well-made product - Workmanship is flawless. It is quiet and it has several options for winding which is excellent since one of the watches I wear requires more motion to keep it working when I am not wearing it. Very happy with the product. This is a really nice winder with a really high-class finish to the wood. Very visually pleasing. As far as winding, the motor is almost silent Great stuff! Good quality. Elegant look. Very customizable rotations. Soft foam pads will fit any size watch. Very adjustable, able to accommodate a variety of watches needs. Very nice looking. This watch winder is the best hands down. It makes no noise, has different settings and looks really nice. My watch fits perfectly snug on the pillow. Will recommend to my friends. 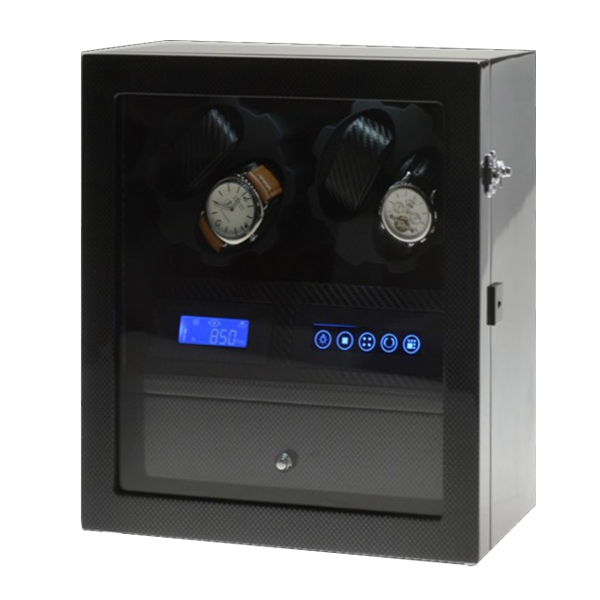 If you're looking for a watch winder, you probably care about making sure your precious watch stays in the top condition that it deserves. 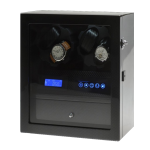 I looked through pretty much all watch winder manufacturer online, and this winder is the only winder that is reasonably priced and has elegant finish that goes along with my watches. Delivered on time and works beyond my expectation. The product description is great, but reality is better! This is a very well presented winder. Enough variation in settings to please most (if not all) watch needs. The quality of finish is impeccable! Brilliant product. Very well constructed and nearly silent while rotating. Highly recommend this for a small watch collection. It looks great and has been working flawlessly. Best winder so far. I paid 3 times more for 1 a few years back. Nowhere near as nice as this. I've had it for almost 6 months now, and it faithfully keeps my watch wound consistently. Can't say that about other winders I've spent $100-200 on, with often faulty winding mechanisms. This winder is a good buy, you won't be disappointed with its performance. Love the fact that it gives the watch the proper movement to keep it winded. Rule of thumb is, pay slightly more for quality stuff is well worthy! Nice design, quiet rotations and most importantly ultra good before and after service. Great stuff and good attitude! Highly recommended! 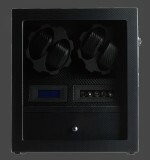 what important most is to a reliable and quiet winder to keep mu watches in sync. Thanks for the recommendation Gage! was a last min gift to my hubby, seller is flexible and can meet me within a day, kudos to her my hubby love it max! Quiet, responsive touch panel to control settings. One of the best in the market which is well-priced! Strongly recommend! 2 words to describe - "Awesome Winder"
unique design which i am unable to find elsewhere. Thumbs up for sucha good product! Works great with my seiko kinetic very happy with this purchase and it is quiet. Quiet winding mechanism. Attractive. Easy set-up. Watches are getting enough motion to keep steady time. The winders run very smoothly and quietly. Just what I needed for use in the bedroom. I own many fine watch winders (Orbita, Scatola del Tempo) when i was staying in the states, but this is among the finest. I highly recommend it. Ordered this item twice. It arrived perfectly both times. Ive had this winder for about 6 months now... no complaints. The winder does make a slight motor sound, but you have to be close to the winder and be listening for it to hear it. For the price point, great buy. I was really looking at the Wolf winders, but this one works and two or three times cheaper than a Wolf. Looks good from inside out. Able to hold 2 of my big watches side by side which most winders are unable to do so. Price is just nice even though there are alot more cheaper ones out there but unreliable to get those. Strongly recommended! Extremely well packaged. Easy to set up with clear simple operating instructions. Very quiet when operating - very impressive. My watches now keep time so no need to keep setting the time and date every time I put on my watches, happy customer. Bought this watch winder on the back of other reviews, and i can honestly say they were right. the case is worth the money alone. The movement is almost silent, the interior finish is excellent, and it does exactly what it is supposed to do. Would recommend this product. Very pleased with item. Well made, ultra quiet and a good price - looks good too. Excellent product. I was so happy with my first purchase, I just bought another for my son. Very quiet and keeps my watch accurate. Well worth the short wait for delivery. The unit is quite substantial, and well made, its fairly heavy which means it is stable when the lid is being opened or closed. The two turners have individual controls, with a choice of five winding programmes for each. So a variety of movements with different requirements can be catered for. The motor is very smooth and virtually silent in operation. I am very pleased with my purchase and would recommend it for your consideration. Great product, I did some research, absolutely silent, cannot hear it at all. Used it with my Tag, I haven't been wearing so much since I got my Apple watch. It has kept perfect time since in the winder. I am blown away by how nice this Watch Winder is. Like many folks, I bought a cheapy $50 winder that ended up being all plastic and lasted 6 months before it broke. I should have saved the money and bought from sgwatchwinder. I was amazed at the quality of this winder! The packaging itself is gorgeous. When I turn this on, it is absolutely silent. I have it in my bedroom its that quiet. It does have a green LED that blinks when turned on, but it doesn't bother me at all. The winder is solid and looks really nice on my dresser, and the controls couldn't be easier. Super happy with this purchase! Excellent. 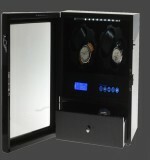 Tried 3 other brands of winder, but had to go back to sgwatchwinder for my 5th watch winder. This is the only product in my experience that last and is very reliable. Thank you. I've only had it for a short while but it seems to be working great. Keeps my watch wound and looks classy.I also like that you can put D batteries in jt, in addition to plugging it in. So if the power goes out the watch will stay wound. It's a nice added touch. I am totally satisfied with the watch winder. Received it quickly with no damage. Works great on my Tag Heuer Grand Carrera. This winder is very quiet! This was an important factory as have it in my bedroom. Previous winder I had was noisy and had to put in another room. Seems to keep my watch working perfectly. It's been 10 months ever since I had my first winder from Loy. I wanted to give it a fair amount to time before giving my review. The first winder has been problem free for the whole time. It has been on 24/7 in mode 850, dual directions (best setting for the watches I have). Now I come back for a second one without hesistation as I trust their workmanship and service. WELL RECOMMENDED! Received this as a gift and contacted merchant to explained on the usage. Extremely helpful and setting up within minutes my watches were placed in a nice display showcase. Highly recommended! Only had product 3 days. Yet highly impressed with presentation of product . Plus product is silent...not noisy at all. I rarely write reviews (although I always read them before buying) but I feel this product is more than worth my time. I've found it to be very quiet either with first table turning or with both tables turning at the same time. The various running time and directional modes are excellent for different requirements or recommendations from your watch manufacturer. The storage drawer is a nice touch and the whole unit shouts quality. I'm very impressed and highly recommend. Brilliant product! Looks really smart and expensive. Quick delivery. Very pleased with this purchase. A very smart product which performs perfectly. It is a little larger than I expected, but it works great. Does exactly what you would expect. It is nice that the controls are in front so they are easy to get to and I like that it can run on D batteries so I will almost never have to change them. This is so easy to setup. Most impotantly, it's silent too! I have it next to my bed on top of my bedside table... About 30cm from my head and you can't hear a thing! This is my first watch winder and I'd recommend this to anybody who's after one. Pretty fast delivery within the same day. Totally happy with the item. It works fine so far. Silent. Looks good especially with a white dial faced watch.. Nice finishing and solid quality by adequate price. This winder does just what it says. stylish, discrete, no complaints. reasonably priced. would recommend. did not know these products existed until a colleague highly recommended me to sgwatchwinder. Great buy! !